Keira Knightley in a Vera Wang gold flower-decked dress. 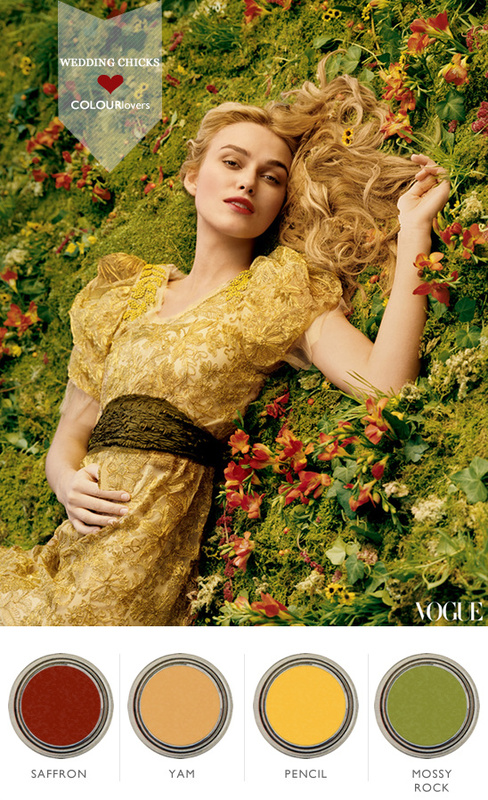 Photographed by Annie Leibovitz, Vogue, December 2005 is the inspiration for our Golden Rainbow wedding color palette. You can see complete info on our COLOURlovers palette by clicking here. This color palette would work for any wedding fall or spring. We can already see the vintage tin canisters overflowing with ferns, alstromerias, string of pearls and solid asters. To see exactly what these flowers look like visit our Orange Flower Guide, Green Flower Guide and Yellow Flower Guide.